Find the treasure of Robber's Gorge. Investigate Robber's Gorge for a secret trapdoor. Find the journal in Robber's Cove. Follow the clues to the bandit leader's secret treasure. 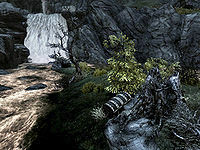 On the road between Rorikstead and Dragon Bridge, near Karth River, a group of bandits has taken over an old overhanging bridge and set up a clever method for ambushing travelers and caravans. 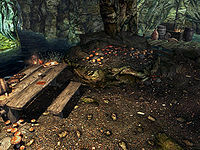 As soon as you approach the bridge, the bandits will release a few boulders to block the path, then talk to you from their safe spot above: "All right, that's far enough. You know how this works- toll here is 100 gold." If you question the meaning of a "toll" in the middle of nowhere, you will be told: "Don't play dumb with me. Pay up, and you walk right through. Refuse, and you'll never see the other side." You can choose to pay the gold and they will let you pass unharmed, while the other options will make them turn hostile. 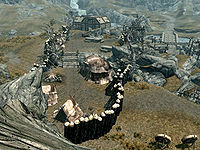 Regardless of your choice, the bandit camp at Robber's Gorge has been set up right next to the road, so head up there and the bandits will attack anyway. Kill the bandit guarding the entrance and deal with the three on the overhanging bridge, then enter Robber's Gorge through the door. The huge camp is an extension of the ambush bridge and consists of several tents with bedrolls. A few bandits will attack you on sight as you enter. Your target is the wooden house in the southern section of the camp: the home of the Bandit Leader. He will attack the moment you enter, so defeat him and take a look around for the Archery skill book The Black Arrow, v2 on a table and a chest with some decent loot. The bandit leader carries a boss-leveled amount of gold along with the key to Robber's Cove. Alternatively, a second key can be found on a dresser in one of the bedrooms. Claim the key and locate the trap door leading underground to the hidden cave, Robbers' Cove. "I don't think he found my stash, but it's not safe here. I took the boat out tonight and stowed it on the island to the south, by the old tree stump." Jump into the water and leave the cove through the southern exit. Keep swimming south and you will immediately see a waterfall. At the foot of the waterfall is the island described in the journal, including the old tree stump. Next to the stump is the bandit leader's stash hidden away in a chest, so use the key to unlock it and claim his ill-gotten gains for yourself. All of the quest stages are empty: 0, 10, 11, 20, 30, 40, 50. 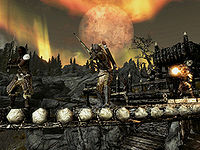 On the PC, it is possible to use the console to advance through the quest by entering setstage dunRobbersGorgeQST stage, where stage is the number of the stage you wish to complete. It is not possible to un-complete (i.e. go back) quest stages, but it is possible to clear all stages of the quest using resetquest dunRobbersGorgeQST.